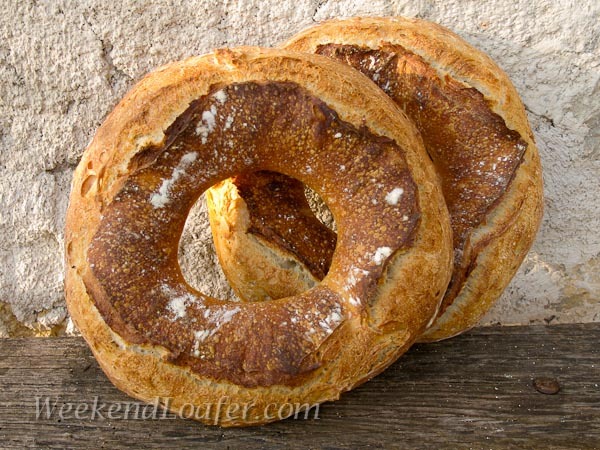 The Auvergne Crown or Couronne shaped loaf, typically made from yeasted white bread dough, can be seen in almost every boulangerie throughout France. When I go to my local boulangerie it is displayed on the rack in the typical round shape along with an epi cut. What separates this Auvergne Crown from all the others is the use of the traditional firm French sourdough, levain,and a long slow rise that gives the wheat time to develop its full potential. 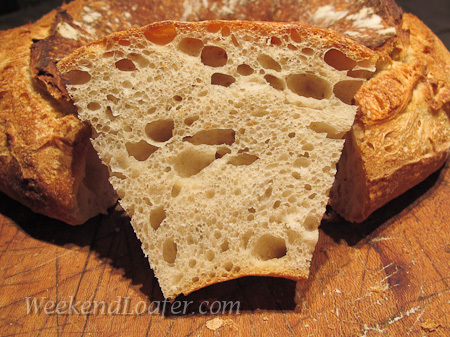 Although this is a simple white dough, this thick crusted bread has an unexpected flavor and quality. I found the best way to eat this is to just tear off a piece…it exposes a crumb that is riddled with many different sized holes. Since undertaking this journey to bake my way through Daniel Leader’s Local Breads , starting with Pain au Levain — that quintessential French sourdough — I’ve now reached the Auvergne Crown (which is a loaf resembling a huge bagel!) and I must say I have been very pleased with the journey and the results! This dough is a pleasure to work with and you will find no hidden surprises along the way. 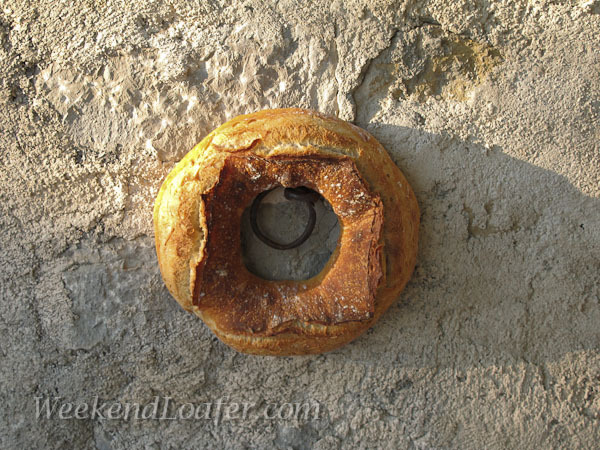 I essentially followed the recipe from Local Breads with one exception…. instead of a 20 minute rest or autolyse after the initial mix to hydrate the flour and develop the gluten, I gave the dough a full one hour rest period. I have been using this extended autolyse for all my hand kneaded breads over the last couple of years, and think that it greatly improves the outcome of the final bread. 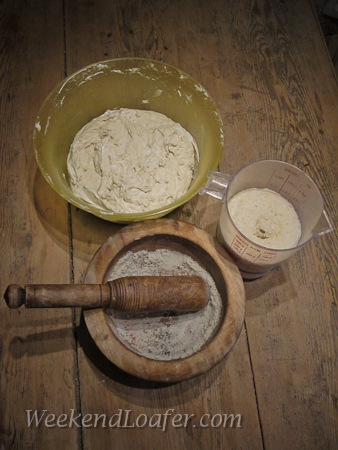 The technique of using autolyse was developed by Professor Raymond Calvel, a bread expert and professor of baking in Paris, who was a pioneer in the revival of modern French baking techniques. 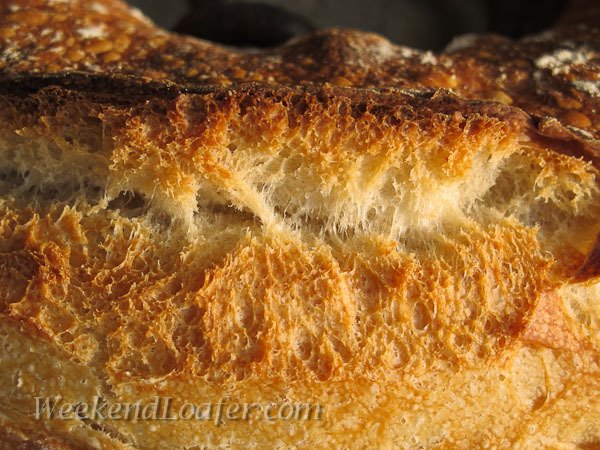 I recently found a fascinating article titled “Experiments with Autolyse“ in Teresa’s blog Discovering Sourdough that confirms for me without any questions the benefits of an extended autolyse. Check out her informative analysis and test bakes of the process….and I think you will be using an extended autolyse on your next bake! 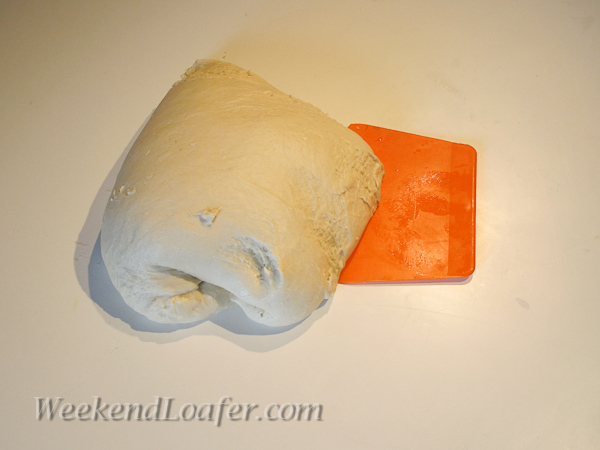 Kneading By hand: Turn the dough out onto your work surface. 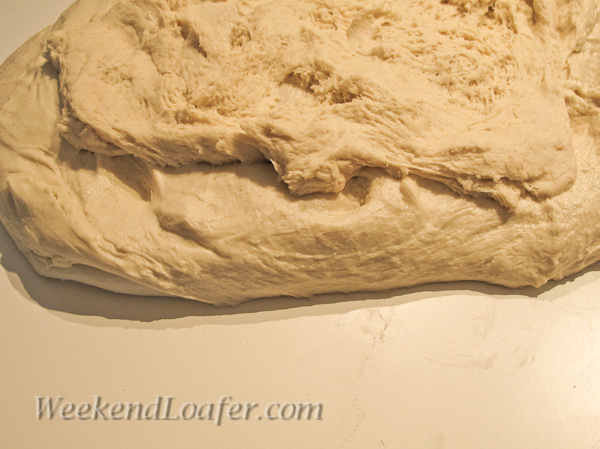 I flatten the dough into a large rectangle; smear the levain on top of the dough. With floured or oiled hands knead a few strokes to fully incorporate the starter, flatten out the dough, evenly disperse the salt and continue kneading for 12 to 15 minutes. I use a combination of the French kneading technique and the method described here if the dough is really wet to start. For the first couple of minutes it will be a sticky mess on your work surface, but do not yield to the temptation of adding more flour. Stop occasionally and use your bench scraper to gather any stray dough from your work surface and your hands. Continue until you have a good gluten development. You should be able to gently stretch a piece of the dough into a thin membrane that you can almost see through without it tearing. By machine: Add the salt and levain and mix on medium speed until the dough cleans up the bowl and you reach a good gluten development. There are many methods for shaping a crown…I will describe two here. The first method is described in the book. Lightly dust the counter with flour and scrape the dough onto the counter. Roll the dough into a long, fat rope about 18 inches long and 3 inches wide. On a well floured piece of parchment, shape into a crown and connect the ends of the rope, overlapping about 4 inches. Press the ends together to firmly seal the ends. Sift a veil of flour over the dough and cover it with plastic. The second method is one that I remember and have adapted from Maggie Glazer’s book, Artisan Breads. Lightly dust the counter with flour and scrape the dough onto the counter. 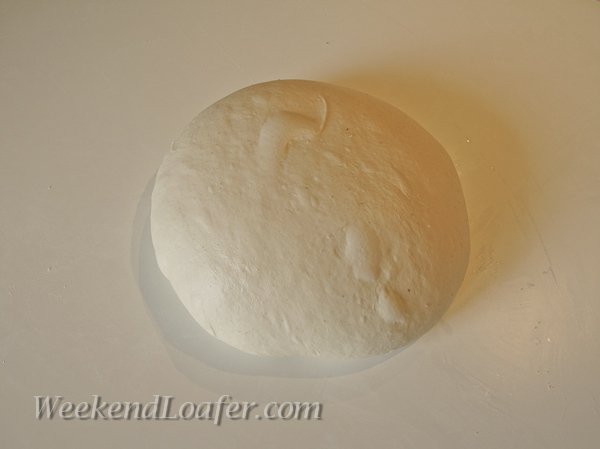 Shape the dough into a boule (round) and lightly flour the surface. Place the boule on a well floured parchment .With your thumbs or elbow make an indentation in the center of boule and then penetrate to the parchment paper. 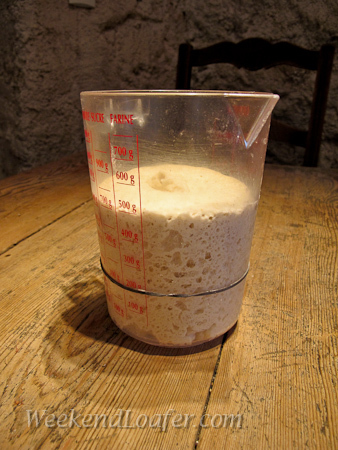 With floured hands, gently stretch and form the dough into a uniform circle gently tucking under the rough edges. (It resembles a big bagel). 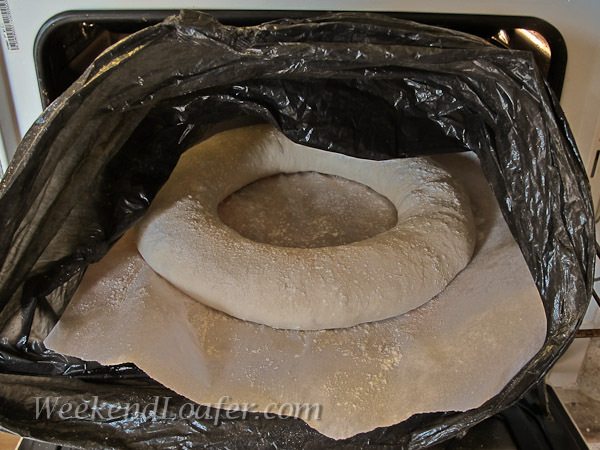 Sift a veil of flour over the dough and cover it with plastic for proofing. About one hour before baking, preheat the oven to 450° with a baking stone and a tray in the bottom of the oven for steam. I like to add one cup of water to the bottom tray a few minutes before putting the loaf in the oven to produce a moist environment for baking the proofed loaf. Uncover and score the crown in a circular cut 1/2″ deep with a wet blade to prevent snagging the dough. (oops..edit 2/2012) Slide the shaped dough (on the parchment paper ) onto the baking stone, add more ¼ cup of water for steam if necessary and turn down the oven to 400-425°, continue to bake for 35 to 40 minutes. (I turn the oven down to 425° and then after 20 minutes, rotate the loaf to get an even distribution of the heat.) Bake the loaves until they are an even golden brown. I like to give my bread a bold bake…so I leave it in a little longer. Remove loaf from oven with parchment paper. Let cool for at least one hour on a wire rack before digging in. The Crown will stay fresh for about three days. I like to cover the cut ends with a piece of plastic wrap secured with a rubber band and wrapped in a kitchen towel ,a piece of linen or place in a paper bag.